The best way to predict the future? Make it. Communications, technology, data and analytics that get you ready for tomorrow. President’s Memo part, to the strength of our mission. 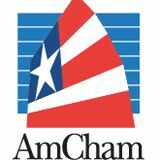 But also thanks to the time and care that AmCham’s leaders have put into advocacy and thought leadership. I hope you will join us on this exploration, starting with our hosting of the Asia Pacific Council of American Chambers summit on March 4 & 5, where we will delve into key themes related to the future of US trade and investment in Asia with our chamber peers from across the region, along with corporate and government leaders. While our long-standing success certainly justifies a birthday bash, we are doing much more than looking back on a colorful history, a history in which the chamber and its members played a central role at watershed moments. Also keep posted for details on events throughout the year, and book your table for our annual ball. This year’s theme is the golden sound of Motown – which, like your chamber, just gets better and better with age. See you there. Instead of resting on our laurels we plan to look ahead to how business and trade will likely develop in Hong Kong over the next 50 years and how US companies can play a role. We also plan to groom the next generation of chamber talent by launching a new leadership program for junior executives. I think looking ahead will be even more fun than the champagne toasts in remembrance of times past. While geopolitically it is obvious that free trade faces potent challenges at this crucial juncture, emerging technology and new initiatives could open fresh and inspiring opportunities. VF Asia Pacific Sourcing S. a. r. l.
If you aren’t from Hong Kong originally, where is home? How long have you been living/working here? Home is now Hong Kong actually! Although I am originally from England, I have been in HK almost 10 years and really feel like this is home now. Dim sum or boozy brunch? Depending on my mood both could work...but both would have to have alcohol! What is one thing people would be surprised to learn about you? In addition to my main role I also play double (slap) bass in a rockabilly band. If I wasn’t a business leader, I would be… I would love to say musician (see above), but more seriously a university professor, I have done it parttime and I enjoy teaching. What was your first ever job? Bank Clerk. Favorite piece of advice? Life is too short, don’t waste it, find something you are passionate about and do that. Outside the office, where can we find you / what can we find you doing? Discovery Bay (when in Hong Kong which is not often as I cover APAC and travel regularly), practicing my bass (sorry to my neighbors) or in the pub. Last place you visited and next destination on your travel checklist? Just returned from a conference in Honolulu, which was my first time there, next first is to French Polynesia (Tahiti/Moorea & Bora Bora) in a couple of weeks’ time. ‘Life is too short, don’t waste it, find something you are passionate about and do that’ What attracted you to Amcham? I have been a member off and on since I moved to Hong Kong in 2008, as I find it an excellent networking and social group. My company is US based so many of the members know who we are without me having to explain. Which AmCham event are we likely to find you at next? Hopefully I will make the Thanksgiving Lunch, which is always a great event. New Chairman Robert Grieves finds the past a source of inspiration when contemplating AmCham’s future in an uncertain world The French have a saying for it: Plus ça change, plus c'est la même chose. Or, the more things change, the more they feel the same. This enigmatic contradiction may offer some comfort when we contemplate – to channel a more contemporary and thoroughly American trope from the Temptations and Tamla Motown – the “Ball of Confusion... that’s what the world is today.” As this magazine goes to press, US President Donald Trump and China’s Xi Jinping are circling each other, building up for another summit as the two sides engage in 11th-hour talks to head off a potentially catastrophic full-blown trade war. Already, there are signs of severe stresses in the global economy. Interest rates are back on hold, throwing into doubt the cycle of economic tightening seen as a crucial stage in normalization after the pain and painfully long recovery from the global financial crisis. China’s economy is slowing, with particular concerns over consumer spending that dents hopes of a rebalancing in the Chinese economic model. By the time AmCham hosts the annual summit of Asia Pacific Council of American Chambers on March 4 & 5, we will know whether the US and China have headed off immediate calamity in the shape of Trump’s March 1 deadline to avoid sweeping and swingeing tariff hikes. an unprecedented pace? It’s becoming harder to sort wheat from chaff; noise from meaningful signals. As AmCham celebrates its 50th birthday, we’ve been trawling through the archives and looking back at our past achievements in search of clues about our likely future, and the perspective of the long-view. Some of the results of this can be seen at our special 50th Anniversary exhibition at the Exchange Square Rotunda from March 18-22. If a deal is struck, will that mark an end to the Trumpian wave of protectionism, or just a short term respite? Will attention turn to other markets – the EU? Japan? Southeast Asia? Is the trade spat just a temporary phenomenon, or something hardwired into the global economic DNA? What becomes immediately clear is that tension, confusion and misunderstanding have always been core risks – if not ever-present features – in the relationship between Washington and Beijing. What’s also shone out has been AmCham’s role as a source of ballast and clear-sighted reason in that relationship: From the foundational moment of our organization, the chamber has been a constant and consistent voice calling for free and fair trade – including over access to China’s markets. By campaigning on behalf of international business, AmCham helped create the conditions for an unprecedented period of global prosperity built upon trade and cross-border investment. in Washington and Beijing, and advocating on behalf of international business and the interests of its membership throughout Asia. 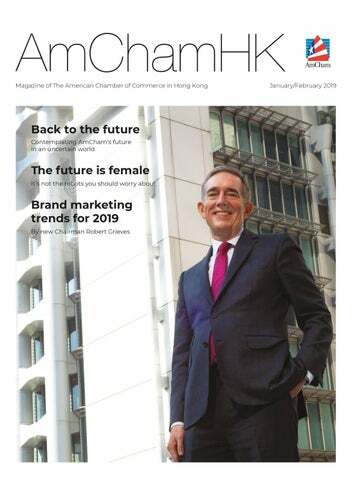 AmCham Hong Kong will continue to play an influential role in the next 50 years. We are looking at how technology is changing the way people work, and the skills required to manage successful businesses in the next half century. We will also launch a Future Leaders program, which will bring together a talented crop of young people for a year-long program devoted to building leadership skills across a variety of sectors as well as develop a pipeline of future Chamber leaders. This year, we want to sharpen our advocacy efforts in both Washington and Beijing. AmCham advocacy on behalf of Hong Kong has become increasingly more important as Hong Kong faces pressure from the north and from Washington as a result of trade war friction and as the Hong Kong economy becomes increasingly more integrated with the Mainland China economy. We will refine our messages for the Washington Doorknock according to the latest developments amid US-China trade tensions. We look forward to a strong delegation of business executives joining us to make our case as clear and convincing as possible to lawmakers on Capitol Hill. In our interactions with stakeholders we will underline Hong Kong’s role as a hub for business in Asia and continue to emphasize the city’s traditional role as a gateway into and out of China. We believe this aligns with the US Indo Pacific Strategy and the Asia Reassurance Initiative Act, recently passed by Congress, as well as the Hong Kong government’s goal to broaden and deepen collaboration with Asean countries after signing a series of Free Trade Agreements. University announced that they are setting up a laboratory in Hong Kong Science and Technology Park in an ambitious joint effort to make detection of diseases such as cancer faster, easier and more precise. Earlier this month, the first international research center in Hong Kong to focus on neurodegenerative diseases such as dementia was announced. The center will be established by the Hong Kong University of Science and Technology, Harvard Medical School, the Stanford University School of Medicine, and University College London. DESIGNING A LIVABLE CITY American urban design expertise can be leveraged to make Hong Kong a more livable city. Former Harborfront Commissioner Nicholas Brooke a few years ago visited an AmCham Board meeting to discuss the governmentâ&#x20AC;&#x2122;s goal of making Hong Kong one of the most livable cities in Asia. STEM EDUCATION American educational institutions can play an important role in preparing Hong Kong students for the workplace of the future. Cooperation may range from STEM education for women to applications of fintech in the financial services space. We intend to bolster this initiative with at least one STEM education event held in conjunction with our Future of Work series. On behalf of AmCham I asked that government come up with a holistic vision for the Victoria Harbour front development in a design-led approach that would invite a world design competition following the great examples of Sydney, New York, London, Amsterdam and others. We believe project quality excellence, environmental safeguards and the public interest should be central components of a project that faces iconic Victoria Harbour. A highest bid approach that puts design as a lower priority sets a bad standard for Hong Kong as a worldclass city. This year AmCham will continue to pay close attention to this issue. THE FUTURE OF WORK Talent continues to stand out as a priority issue for Hong Kong as it seeks to enhance its competitiveness. Hong Kong should continue to reform its educational system in accordance with its needs and current occupational trends, and consider expanding the import of talent. The Hong Kong government should also look into opportunities to extend the “Hong Kong model” – for example, staying ahead in global education rankings and aligning with international standards – in Greater Bay Area cities. ‘Being elected Chairman of AmCham reminds me of the parrot story that Dan Tully, a former chairman of Merrill Lynch, used to tell when I worked for him more than 20 years ago,’ Grieves told the luncheon audience. For those who missed it, here it is: One day a man goes to a pet shop to buy a parrot. The assistant takes the man to the parrot section and asks him to choose one. There are three parrots in three separate cages. The man asks, "How much is the yellow one?" The assistant says, "US$2,000." The man is shocked and asks why the parrot is so expensive. THE ENVIRONMENT Hong Kong’s environmental issues manifest themselves in polluted water, garbage-strewn beaches, and unhealthy air. Through AmCham’s Environment & Sustainability and CSR committees the chamber will advocate practical ways to make Hong Kong cleaner and healthier. AmCham member firms are already vocal in this advocacy effort. The assistant explains, "This parrot is a very special one. He knows typewriting and can type really fast." "What about the green one?" the man asks. The assistant says, "He costs US$5,000 because he knows typewriting and can answer incoming telephone calls and take notes." "What about the red one?" the visibly shaken man asks. The assistant says, "That one's US$10,000." The man looks closely at the red parrot, which appears fairly mean and shabby, and asks, "What does HE do?" "I don’t know, " the assistant admits, "but the other two parrots call him ‘Chairman.’"
A special shout-out for David Cruikshank and Jennifer Wong for getting this year’s Ball rolling — with the toe-tapping theme of Motown. Golden sounds for AmCham’s Golden Jubilee. AmCham is preparing to host the APCAC Business Summit 2019 on March 4-5, an annual event which will see over 300 business and political leaders from around Asia and the US gather at the Grand Hyatt Hong Kong to discuss international trade issues against the backdrop of today’s political climate, and the implications for businesses in the region. APCAC is an association of American Chambers of Commerce from across the Asia-Pacific. speaking opportunity on the panel. According to the 2018 Pew survey, just 53 percent of US respondents felt that “being assertive” helps a woman’s chances of getting ahead at work, compared to the 73 percent who felt that the same quality can help a man. Men can do their bit by acknowledging workplace gender biases which prevent their female colleagues from reaching their full potential, and if possible, speaking out against them. “It’s not the women we need to fix,” he says. 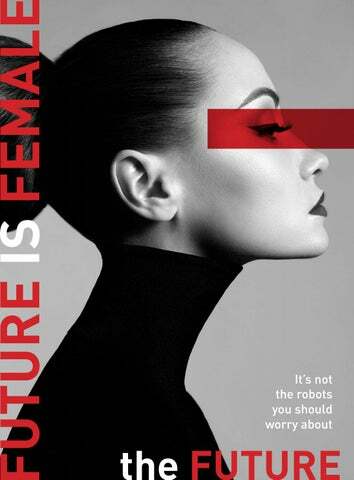 Redefining success traits A February 2018 report by PwC confirms what we’ve been told so far, which is that automation and AI will impact men and women in different ways. 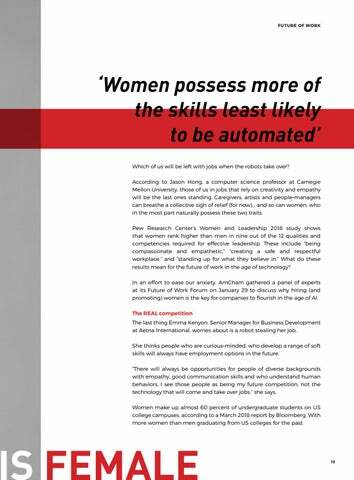 The study, which looked at the jobs of over 200,000 workers across 29 countries and the skills involved in each, revealed that 34 percent of jobs held by men, versus 26 percent of jobs held by women, are at risk of being automated. “Soft skills, people skills — things we associate with a more feminine, caring approach to the workplace will be valued more in the future,” says Rob Koepp, Director at The Economist Corporate Network of The Economist Group. ‘Human’ qualities will become highly sought after in the best employers as well. “Employers must accommodate people's need for flexible time — not just seeing people as resources who have to show up on time to do a job,” he says. Robots, people are not. Citing Susan Cain’s award-winning book Quiet: The Power of Introverts in a World That Can’t Stop Talking, Koepp says introverted traits such as listening and learning, still viewed largely as feminine qualities, are not typically associated with workplace success though they should be. “In our capitalist workplace, ‘alpha, extroverted’ individuals with a ‘not-always-right-but-never-indoubt’ confidence are rewarded. But we are all different,” he says. Welcome to the future of work. Leave your preconceived notions of success at the door. The Hong Kong Association of the Pharmaceutical Industry (HKAPI) held its annual dinner on April 26, 2018. HKAPI President Caroline Johnson and HK CE Carrie Lam were in attendance. more resources to these two areas and extend screening programs to diseases that have a profound impact on society and families, such as diabetes, hepatitis and dementia. industry would like to be involved in discussions about resource allocation to ensure that funds are spent effectively and that more multinational pharmaceutical companies are attracted to invest in Hong Kong. Apart from tax incentives, a good R&D infrastructure and a strong system for implementation are vital. For example, Hong Kong would like to develop itself into a biomedical hub focused on clinical R&D of medicines for humans, given that clinical research paves the way for the growth of pre-clinical and other research industries. The Hong Kong Association of the Pharmaceutical Industry in 2017 asked its 13 members – all multinationals – for their views on the importance of drivers in choosing the location of clinical trials. The attractiveness of Hong Kong by these measures was collected and analyzed. Of the 527 clinical trials conducted in 2015 in four Asian locations, 38 (7.2 percent) were in Hong Kong. This share was far below the other locations of South Korea, Taiwan and Singapore. Survey results show that high data quality, experienced and credible investigators, mutual recognition of trial data between Hong Kong and Mainland China, well-equipped hospitals and simple and transparent approval procedures were Hong Kong’s top attractions as a location for clinical trials. combining ethics committees in different hospitals, providing a seed fund for clinical trials and reviewing incentives for pharmaceutical companies to support clinical trials in the HA – i.e. facilitating early access to new/innovative medicine in the public system. There are also untapped opportunities to leverage Hong Kong’s strong relationship with China. The system of single pathways could be extended to all hospitals in the Greater Bay Area to bring investment while attracting and leveraging world class investigators. involve pharmaceutical companies, as is the case in other countries, in the strategic development of genomic medicine in Hong Kong. To ensure that genomic solutions are pragmatic and sustainable, all stakeholders can work together to have a rounded view on how to access existing health databases as well as on how to collect relevant information for the future. This will accelerate the development of new knowledge, medicines, diagnostics and devices. In addition, parties can collaborate to adjust work procedures and build the right infrastructure. In the long term, many disease areas will benefit, including rare and chronic conditions and cancer. CONCLUSION The pharmaceutical industry is an important partner in the healthcare ecosystem as it invests billions of dollars in R&D and strives to ensure the application of the most advanced medical technologies to help patients in the real world. Only when these technologies are made widely available, can the value of medicine bring real benefits to humankind. For medical technology to develop in Hong Kong and support the advancement of medical practice, the pharmaceutical industry should be considered a core stakeholder. Only by working together, can we ensure a pragmatic, cohesive and sustainable healthcare system for Hong Kong. The Healthcare & Insurance Committee provides a platform for AmCham members to share information, exchange views, network and advocate about trends and developments in medical insurance and healthcare issues. The committee focuses on all aspects of Hong Kong’s health and private medical insurance, including regulations, innovation, technology, research and development, disease prevention and treatment, as well as commercial opportunities in the Greater Bay Area. The committee will enhance the knowledge of AmCham members through regular meetings, forums and special events as well as support AmCham in responding to or submitting advocacy positions on insurance or healthrelated matters. Amelie Dionne-Charest chairs the committee. As stakeholders in healthcare, the pharmaceutical industry, together with the Hong Kong Association of the Pharmaceutical Industry and AmCham, take various opportunities to engage in dialogue with the government on how to collaborate to improve healthcare services. leaders and indeed key employees brand themselves plays an outsized role in the way audiences connect with and trust a brand. Related to executive communications is a not-so-new but still important channel of brand communication that is relevant in 2019 – thought leadership. Thought leadership programs communicate the insights and value that a brand brings to the market. Thought leadership content ranges from insightful market analysis to a company’s sustainability efforts. PR teams must be ready to work alongside marketing teams to help key employees create content that builds their thought leadership and connects them to their audiences. as awareness, consideration and behavior.” Marketers can analyze what has caused a trend in the past and then predict when it will occur again. Big data enables them to assess trending topics, or identify what causes a negative reaction within a particular company or industry. Because big data can analyze trends within large sets of information, it can be used to correlate data over long periods of time. Big data can also help marketers adjust messaging based on the trends they find, and more effectively generate interest in a product by analyzing which audience to target first. Trends such as big data mining can help companies build trust with their audiences more accurately and cost effectively than in the past. PR for CEOs and other key corporate officials can also build trust between brands and their audiences if handled correctly. Where marketers and PR teams continue to run into difficulty is in linking their corporate clients to causes, such as economic equality, sustainability and social justice, only to face scandals within the client organization that negate audience trust. This year we will see which companies develop the most effective brand campaigns, and which crash and burn against the barriers of distrust and skepticism. Robert T. Grieves is AmCham’s Chairman for 2019. He is also the Founder, Chairman and CEO of Hamilton Advisors Ltd, a strategic communications firm based in Hong Kong. WE ARE REFINITIV CONNECTING THE FINANCIAL COMMUNITY TO WHAT’S NEXT. We equip a network of over 40,000 global institutions with best-in-class data, technology, and expertise that helps support new, more agile ways of working. From trading to investing, from market regulation to risk, our insight drives the financial industry forward. Find out how our insight can inform – and transform – your business. in the West is WhatsApp, not WeChat; people use PayPal, not Alipay, for digital payments; Google dominates the search market, not Baidu. ikTok is a video sharing platform with a twist. instant gratification. Similar to Vine, which shut down in 2016, TikTok can be thought of as a video version of Instagram or Snapchat. already been downloaded more than 80m times in the US, logging 4m downloads from the App Store in October alone. It is also one of the most popular apps on Google Play. same algorithms to provide relevant video feeds to TikTok users. By the start of 2017, Douyin had become China’s most popular mobile video app. In November of the same year, ByteDance spent US$1 billion to acquire a competing video sharing site called Musical.ly. While Musical.ly was also founded in China, most of its users were based in the US. The combined global reach of TikTok and Musical.ly made for a powerful combination. also taking note, with Facebook quietly launching a TikTok competitor app called Lasso in November 2018. Michael Wade is Professor of Innovation and Strategy, Cisco Chair in Digital Business Transformation at IMD Business School. Jialu Shan is Research Associate at the Global Center for Digital Business Transformation, IMD Business School. This article was originally published on The Conversation. Hong Kong has once again topped the Heritage Foundation's global Index of Economic Freedom for the 25th consecutive year! The Foundation announced the 2019 results at the newly refurbished AmCham offices on Jan 28, lauding Hong Kong for its resilient economy, light regulatory touch, low taxes and defense of property rights, among other measures. Let there be light AmCham’s offices get a makeover! Pantry and conference room No more plastic cups or cutlery! like the annual Trust Barometer. Edelman’s specialist team of professionals cover creative, digital, reputation management, stakeholder, influencer and brand engagement, events organization, CSR, government campaigns, advertising as well as crisis, consumer and corporate communications. Professional Association: Foreign Correspondents’ Club, Hong Kong Columbia University Alumni Association New York University Alumni Association Oxford University Alumni Association Beta Gamma Sigma Company Activities: Sinclair is a multi award-winning New Narrative Ltd. (n/n) is a Hong Kong and New York-based, contentfocused marketing agency founded by professionals from the world’s top media organisations. The company conceptualizes and creates custom research, thought leadership and editorial campaigns across a range of formats that help its clients highlight their expertise, develop compelling voices in the marketplace and ultimately drive business growth. Tel: (852) 2530 0228 Fax: (852) 2845 0363 Email: fhhk@fleishman.com Website: www.fleishmanhillard.com.hk Key Contacts: Rachel Catanach, President & Sr Partner, Greater China Patrick Yu, General Manager, SVP & Partner, HK Kitty Lee, SVP & Deputy General Manager, HK Major Business: Public Relations, Reputation Management, Public Affairs, Brand Marketing, Media Relations, Investor Relations, Crisis Management, Internal Communications, Social Media Management, Content Development, Influencer Relations Professional Associations: •	Agency of the Year (Silver) 2018 / Marketing Magazine •	Greater China Consultancy of the Year 2017 / PRWeek Awards Asia •	B2B Agency of the Year (GOLD) 2017 | Marketing-Interactive Hong Kong •	Best Places to Work 2017 | PRWeek •	Best Places to Work for LGBTQ Equality 2018 | Human Rights Campaign •	Top Companies for Women 2010-2017 | National Association for Female Executives Professional Associations: Member of PRHK Company Activities: FleishmanHillard is the world’s most complete global communications firm. In Asia-Pacific, the firm is headquartered in Hong Kong, and has operations in Bangalore, Bangkok, Beijing, Jakarta, Manila, Mumbai, New Delhi, Seoul, Shanghai, Singapore, Sydney and Tokyo. FleishmanHillard was named Marketing Magazine’s 2018 Agency of the Year Silver Award and PRWeek’s 2017 Greater China Agency of the Year. FleishmanHillard is part of Omnicom Group Inc., and has more than 85 offices in more than 30 countries, plus affiliates in 42 countries. Tel: (852) 2488 8866 Email: rgrieves@hamiltonadvisorsltd.com Website: www.hamiltonadvisorsltd.com Key Contacts: Robert Grieves, Chairman Anne LeBourgeois, Managing Director Major Business: Public Relations, Media Relations, Investor Relations, Brand and Reputation Management, Digital and Social Media, Executive Communications and Media Training Professional Associations: American Chamber of Commerce in Hong Kong, Public Relations Hong Kong (PRHK), The American Club Hong Kong, The Foreign Correspondents’ Club HK (FCC) Company Activities: Hamilton Advisors is a Hong Kong-based consultancy providing premium strategic communications services to financial institutions, listed and privately-held companies, and professional organizations. We help clients build brand and reputation, strengthen stakeholder relationships and achieve business objectives. Our team includes multicultural public relations experts with extensive experience throughout the Asia-Pacific region and in global markets. Major Business: Corporate communications, integrated marketing services, social and digital communications, crisis and issues management, financial communications, public affairs and media training Notable Clients: McDonald’s, Ping An Insurance, Alibaba, HSBC, CNOOC, ZhongAn Insurance, China National Petroleum, Rolex, Korean Air, Hong Kong Airlines, CSL1O1O and Huawei Professional Association: PR Association of Hong Kong Company Activities Hill+Knowlton Strategies is a public relations and integrated communications agency with more than 85 offices around the globe. H+K Hong Kong is home to over 100 creative strategists, content creators, digital experts, and storytellers experienced in helping clients strengthen brands, reputations and bottom lines. We understand how audiences think and engage, and recognize that in today’s ever-connected world, it’s all about business-to-human integrated communications. Whether it is investor relations, corporate communications, digital communications, or innovative marketing communication campaigns, H+K Hong Kong crafts credible and engaging ideas that deliver cut-through and measurable impact in an always-on world. We are proud to say that our in depth local knowledge, coupled with our global reach, means we are better positioned to take more Companies global than ever before. RFI Asia Limited Address: Unit B-C, 12/F, Casey Aberdeen House, 38 Heung Yip Road, Wong Chuk Hang, Hong Kong Tel: +852 2237 1661 Email: ask@rfi.asia Website: www.rfi.asia	Key Contacts: David Ko, SVP, Asia Pacific | Max Wang, Group Director Year Established: 2013 Company Activities/History & Special Features: RFI Asia is a digital consultancy and integrated marketing agency comprising a cutting-edge team of digital strategists, creatives, scientists, and technologists, brought together by a passion to change minds and influence behavior. Full-service digital arm of Ruder Finn Asia. We believe in bold visions and results-oriented digital strategy that enable our highly specialized teams covering content strategy and development, multimedia production, web and app development, immersive storytelling, and analytics. With a reputation of anchoring creativity designed with user in mind, our solutions are simple and elegant and built to scale with execution based on real-time metrics that equip brands for optimal consumer engagement and business success. Introducing BEACON, RFI Asia’s advanced Insights & Analytics suite delivering actionable intelligent that embolden brands to outperform their peers across a wide range of KPIs, from predictive insight to engagement to conversion. In good company, our clients are a robust mix of market leaders, transformation drivers and industry disrupters, including HSBC, Swire Properties, The Peninsula Hotel, The Peninsula Boutique, Lee Kum Kee, Deutsche Bank, CLP, L’Oréal and more. Recognized in the region by industry gatekeepers the likes of Mumbrella, PR Awards and The Holmes Report, we take pride in our award-winning work, delivering ideas that have impact. RUDER FINN ASIA LTD 24/F Neich Tower, 128 Gloucester Road, Hong Kong | Tel: (852) 2521 0800 | Fax: (852) 2521 7088 Email: hkoffice@ruderfinnasia.com | Website: www.ruderfinnasia.com | Year Established: 1989 | Staff Size: 490 Key Contacts: Jean-Michel Dumont, Chairman, Ruder Finn Asia Elan Shou, Regional Director of Asia Paul Yang, Deputy General Manager, Ruder Finn Hong Kong Charles Lankester, Executive Vice President, Global Reputation & Risk Management Professional Associations: CPRF, American Chamber, British Chamber | Major Business: Integrated communications, Reputation management, luxury sector communications, digital and social media marketing strategy & services, corporate, brand and crisis communications Company Activities: Ruder Finn Asia – The Art and Science of Engagement Founded in 1989, Ruder Finn Asia (www.ruderfinnasia.com) is the Asia-Pacific subsidiary of New York-based Ruder Finn (www.ruderfinn.com), a global communications consulting firm, producing award-winning work at the intersection of content, creative and digital. Ruder Finn Asia today employs close to 490 consultants in Asia-Pacific and has offices in Beijing, Shanghai, Guangzhou, Hong Kong, Kuala Lumpur, Singapore, Mumbai, New Delhi and Bangalore. The firm is represented across all other regional markets through a network of high quality partners. Ruder Finn Asia’s business centers on four strategic pillars: Corporate & Public Trust, Global Connectivity, Health & Wellness and Life+Style. As an integrated communication consultancy, we help our clients engage with those vital to their success, delivering meaningful, measurable, business results through inspirational, data-driven, communications counsel and solutions. Our expertise encompasses reputation management, digital and social marketing strategy, employee engagement, branding and executive skills training. Our research and analysis team provides insights and counsel in market trends, producing annual research reports including the China Luxury Forecast, Physicians Digital Outlook Survey and other publications. Ruder Finn Asia’s key clients include Almond Board of California, Bang & Olufsen, BMS, Emirates, GSK, Hermès, Jumeirah, L’Oréal, Michelin, Omron, Sanofi, VISA, Volkswagen Group and leading brands from the Kering, LVMH and Richemont Groups. Founded by SPRG in 2014, Strategic CSR Network (“SCSR”) is the first and only NGO to be funded and fully supported by a PR consultancy in Hong Kong. It aims to serve as a platform for connecting corporations, NGOs and volunteers to helping local people in need. As of December 2018, SCSR has already received HK$ 4.87M in in-kind donations from 42 corporate donors, held 139 events with 76 community/volunteer partners and attracted an aggregate of 1,660 volunteers who contributed 4,290+ service hours to serve 8,600+ beneficiaries. AmCham estimated there were about 400 American companies and individuals here in late 1969 — 50 years ago! That picture soon changed, with many instrumental in transforming the Central skyline. Happy Birthday AmCham!